The most prestigious awards for successes in the fashion business, the entrepreneurship, the investment policy, the new technologies, the original solutions for presentation, the awards Fashion Mercury 2005 of the Academy for Fashion were awarded at a sophisticated gala review on October, 10 and 11, 2005. This happened at the beginning of Days of the Bulgarian Fashion Sliven 2005 at Imperia hotel complex in the town of Sliven. The best Bulgarian investors, producers, traders and entrepreneurs in five different categories were honored at the ceremony. The event was organized by the Academy for Fashion and Sliven Municipality under the auspices of Mrs. Svetlana Lechkova. 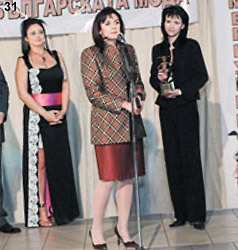 Fashion Mercury 2005 award for entrepreneurship and large scale investment policy in the manufacture and trade with men's clothing was awarded to Agressia Group LTD. The prize in category entrepreneurship and large scale investment policy in the Bulgarian textile was awarded to Miroglio Bulgaria LTD. Irida Fashion House took the award in the field of original designer's solutions in the presentation of the Bulgarian clothing. 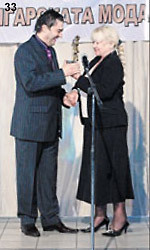 Fashion Mercury 2005 award of the Academy for Fashion in the category Fashion Business, High Quality and New Technologies in Manufacturing Bulgarian clothing was awarded to MirO LTD. The prestigious prize in the category High Quality and Development of Fashion Business in Optics in Bulgaria was given to Kwiat LTD.
Mrs. Kamelia Kassabova, Deputy Chair of Parliament, Mrs. Dora Black, General Director of Triumph International, the patron of the evening Mrs. Svetlana Lechkova, the deputy mayor of Sliven Miss Ofelia Kaneva as well as the chairpersons of the Academy for Fashion, Mrs. Donka Ganeva and Associate Professor Lubomir Stoikov took part in the awarding ceremony. MP. Krustanka Shaklian was also one of the prominent guests. 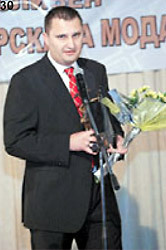 At a refined cocktail party immediately after the fashion show, Mr Yordan Lechkov, Mayor of Sliven, addressed in person all participants, guests and journalists. others, walked on the catwalk. Additional cultural and entertaining program was envisaged for the journalists and the guests who attend ed the Days of Bulgarian Fashion - Sliven 2005, such as a visit to the Musem of Dobri Zheliazkov and the Art Gallery, attendance of a plain air in the village of Ichera and tasting a selection of wines at the Vetrovitite Hulmove (Windy Hills) Chateau. 29. Fashion Mercury Award - bronze plastic made by sculptor Stavri Kalinov. High Quality and Development of Fahion Business in Optics in Bulgaria category. Production of Bulgarian Clothing to Miroslav Stamov - manager of MirO Fashion House. the Days of Bulgarian Fashion in Sliven.